Since the launch of iOS 6 on September 19th, we've been tracking Apple's efforts to promote a new section of the App Store called "App Collections". In late June 2012, Apple launched "Game Collections", which highlighted all the previous game "bundles" Apple had featured on the App Store. For the past couple of years, in fact, Apple has been handpicking apps and games and featuring them in standalone sections often promoted on the front page or elsewhere throughout the Store. For games, such sections included "Big Name Games" and "Benchmark Games". However, Apple often launched new sections while forgetting to add new content to existing ones; furthermore, there wasn't a unified place to browse all the sections launched by Apple through the years. But we've noticed a change in the past months: with a revamp of the Editor's Choice and App of the Week initiatives, Apple also started paying more attention to the curation and discovery aspects of sections. They started by adding new content and launching Game Collections in June; with iOS 6, they created App Collections and featured it in the App Store's rotating banners; and now, they're featuring App Collections directly in the Categories menu. 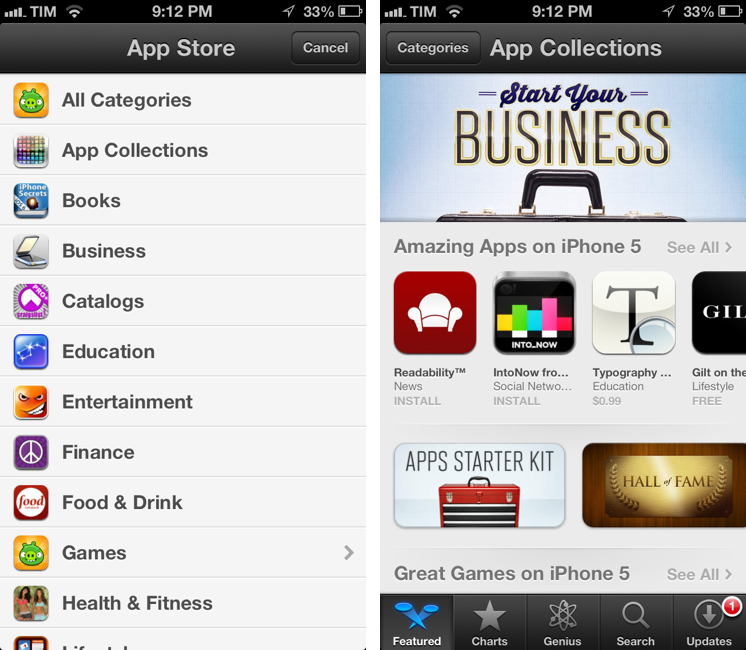 Both on the iPhone and Mac, App Collections are available from the Categories menu of the App Store. On iTunes, they are listed as "iPhone App Collections" and "iPad App Collections". Interestingly, the iPad's Categories still hasn't been updated with the new option. With hundreds of thousands of apps on the App Store, how do you find the apps you'll love using? You're in the right place -- we've gathered our favorites here. Every app in these collections is personally tested and recommended by our editors. Whatever you do with your iPhone, iPad, or iPod touch -- shopping, watching movies, editing photos, and beyond -- you'll find apps that work smartly and beautifully. This may appear like a minor change, but it is, in fact, a signal of a major shift that could soon happen to the App Store's discovery dynamics. As the App Store grows bigger in terms of available content, it'll become harder for users to find the app they're looking for, just like Apple says. Search doesn't help when you don't know what you need yet, and there's only so much space Apple can give to weekly "New and Noteworthy" apps on the Store's front page. An up-to-date, lovingly curated collection of app bundles may become the best way for users to discover new apps. More importantly, app collections will put the focus on what an app does, rather than how it performs in the charts. It is a profound change for developers and users. Essentially, Apple is now treating App Collections as a category that deserves a user's attention just like "Games" or "Productivity". It wouldn't be a surprise, at this point, to see more options like filters coming soon to App Collections as Apple invests more in it. Last, App Collections highlights the human aspect of apps that are tested and recommended by Apple editors. We've long debated the importance of human curation in the App Store, but I think The Iconfactory's Craig Hockenberry summed it up best in our App Store overview from May: “A movie recommendation from Roger Ebert means a lot more to me than a computer generated ranking based on reviewer scores. Automated systems can help, but I think it’s the personal touch that’s missing”.